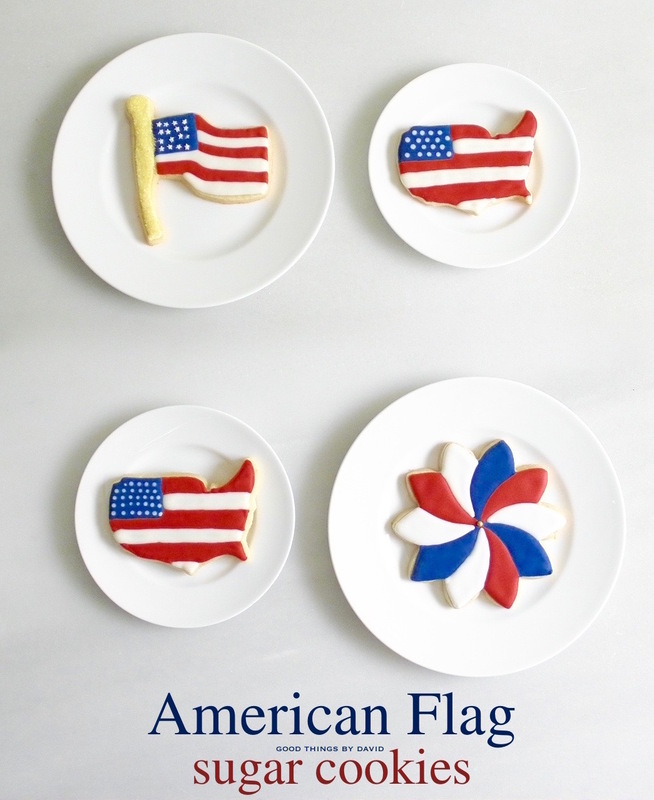 There is nothing like the colors of our American flag. 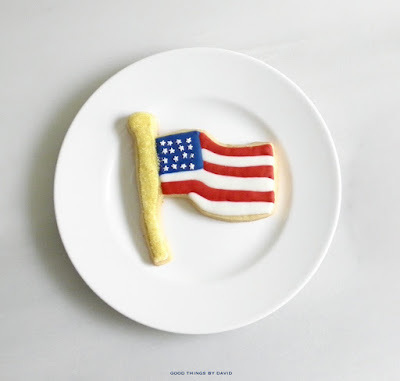 I love seeing that combination throughout the year, whether it's on people's porches, lawns or home decor, but I especially like it in the summer for flag day and around the Fourth of July. 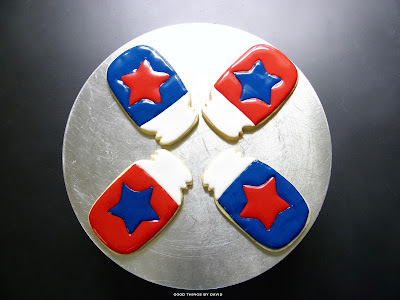 This year I decided to make some American flag-inspired cookies in various shapes in order to celebrate this country's red, white and blue. With a few cookie cutters and some citrus-flavored royal icing, I quickly began to decorate cookies worthy of any patriotic get together this summer. 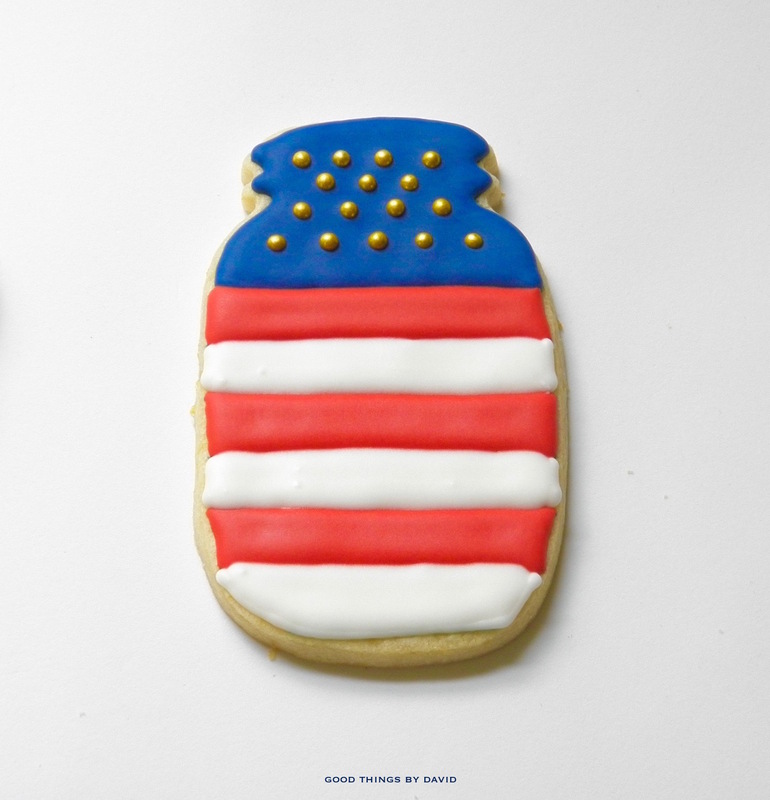 What's nice about working on this type of project is that you can keep the cookie decorations and designs to a minimum. 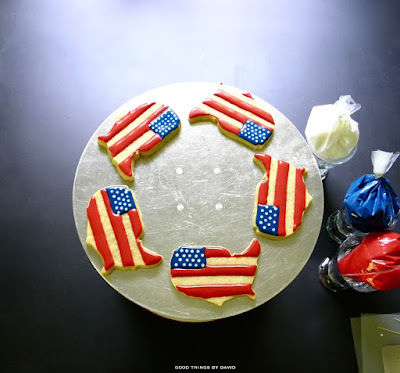 What's important is to capture the spirit of America through the use of a rich, dark blue and a deep, dark red so that the cookies don't look too cartoonish. 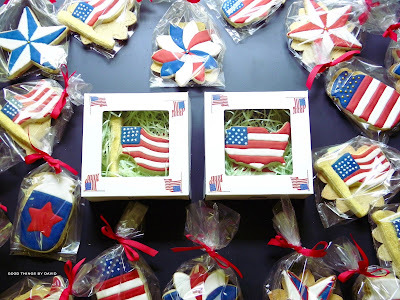 If you're handing these out to individuals, I highly recommend getting clear-topped boxes or clear cellophane bags so that the cookies can peek through. These can be found at any craft or party store. If truth be told, I decided that some people in my life needed a random act of kindness right now, so every single cookie (with the exception of one that I kept) that you see here was handed out to a few friends and family who have been there for me through thick and thin. Depending on how much time you have and how you want to space this project out, all cookie decorating equipment and items should be laid out within easy reach. This is a small list of what I used to make my cookies. 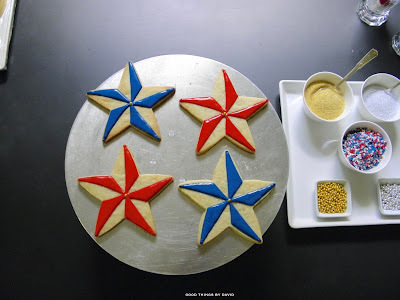 These cookies were cut out with a Ball/Mason jar cookie cutter (found at most cookie decorating stores) and with the large Wilton Sunflower Cookie Cutter (found online or at craft stores). 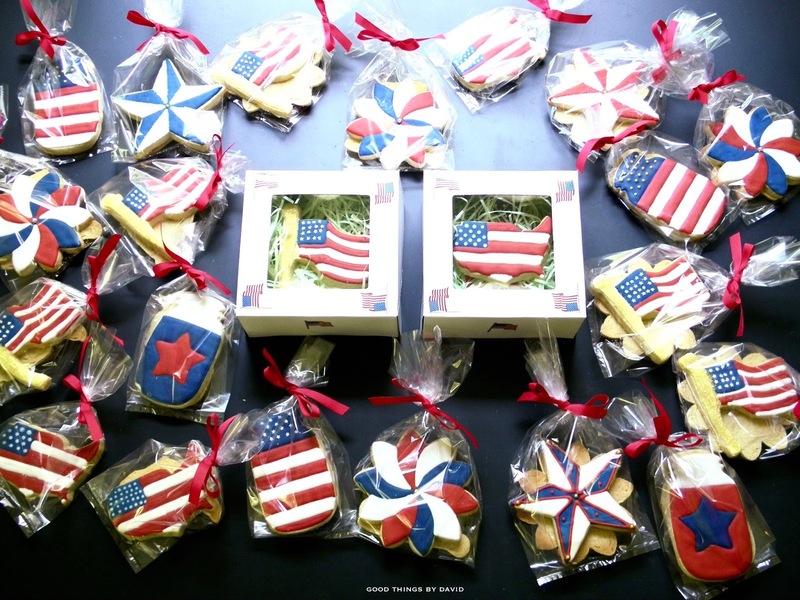 These cookies were cut out using classic, American-made, Foose Cookie Cutters in the shapes of a flag, the United States and a star. 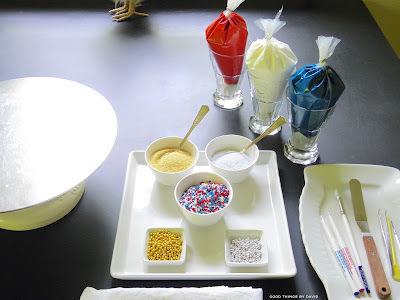 All of my dragées, candies and sanding sugars were placed in small dishes to make handling easier. There is nothing more annoying than trying to shake out sanding sugar from the original jars only to find a big clump inside. Break them apart and keep spoons handy. My cookie decorating tools are kept together. 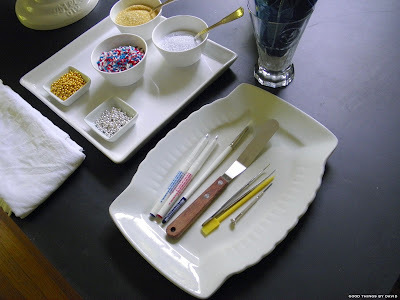 Food-coloring markers, a small paint brush, offset spatula, tweezers and decorating picks were kept on a small ironstone service platter. I know, I know. There are pastry bag holders which keep your decorating bags upright, but my small kitchen can't afford to have anything else! So, I use some pressed glass tumblers for this purpose. 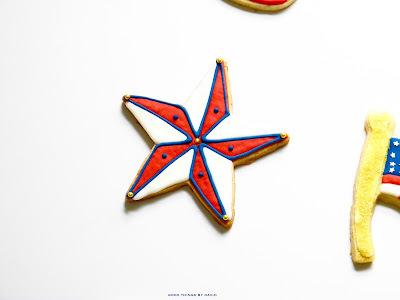 Pinwheel Star Cookies: pinpoint the center of the star and mark it with a food-coloring marker. 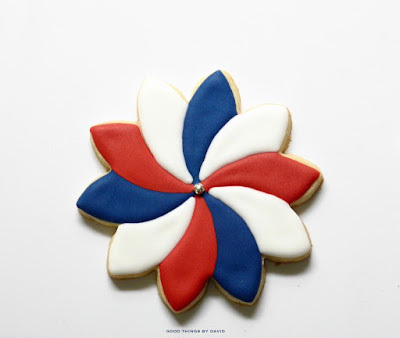 With either red or blue royal icing, create the vanes of the pinwheel. Pipe a line straight down the middle of one of the star corner vertices until you reach the center. Immediately pipe a line back up to the short end, and finish off by piping a bead up to the edge of the star point (this will give the pinwheel its classic shape). 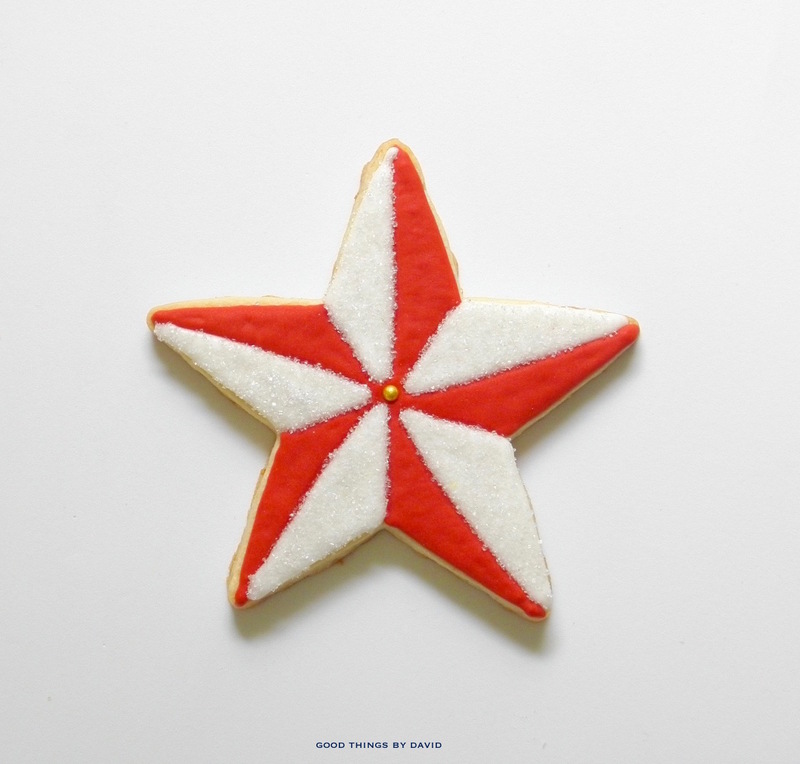 Fill this area with royal icing, and continue piping and flooding all points of the star using this design. Add either a gold or silver dragée in the middle of the pinwheel. Let this dry completely. 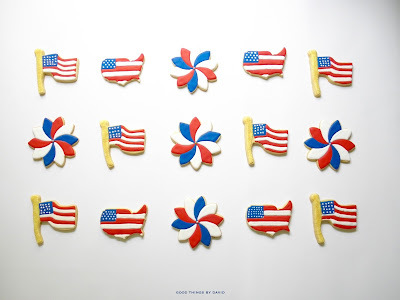 As you can see, some of the pinwheels have gold dragées and some have silver. You decide! 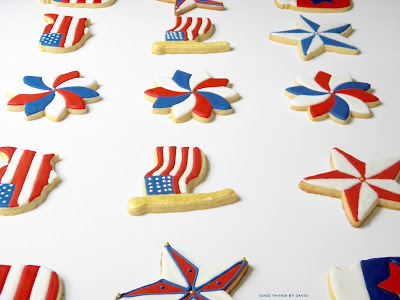 Once the colored portions of the pinwheels have dried, outline and flood the remaining star in white royal icing and flock the icing with sanding sugar while the base is wet. Let this dry completely and brush off any stray sugar crystals when done. 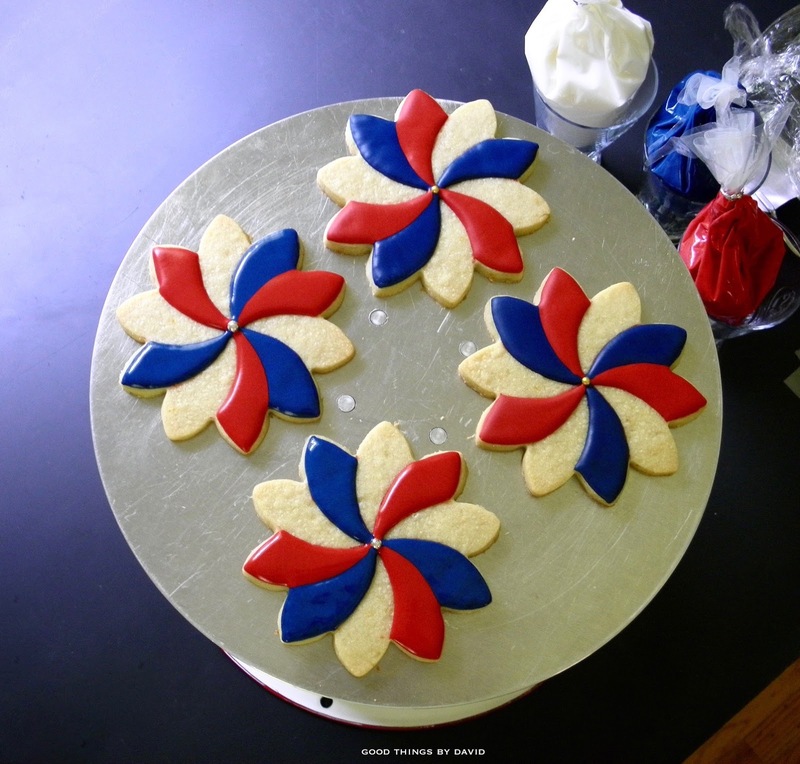 On some of the pinwheels I left the white royal icing free of sanding sugar. I then piped a bead of icing along the edge of the colored star to trace the shape. Extra dragées were added at the ends of the stars. Large Pinwheel Cookies: for the large sunflower shapes, I wanted to create a multi-vaned pinwheel. This presented somewhat of a problem because I had to make sure that the color combination was going to work. 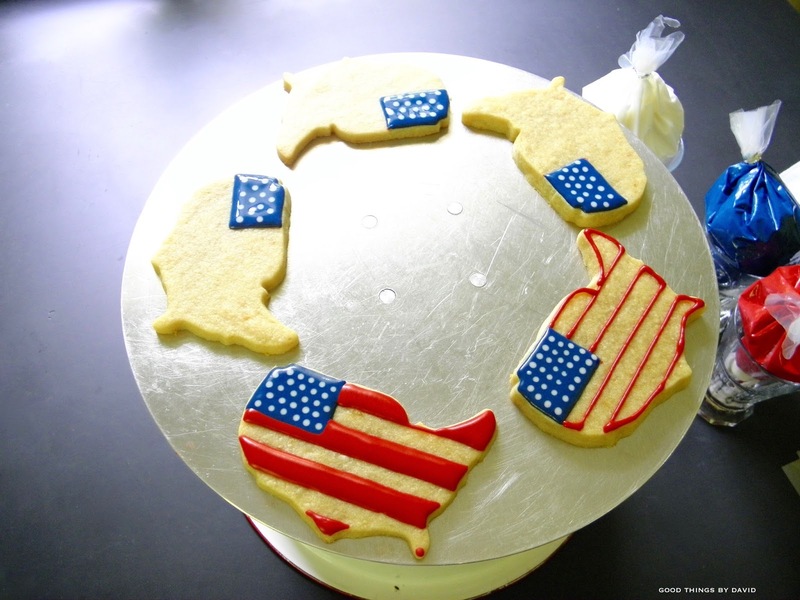 Locate the center of the cookie and mark it. 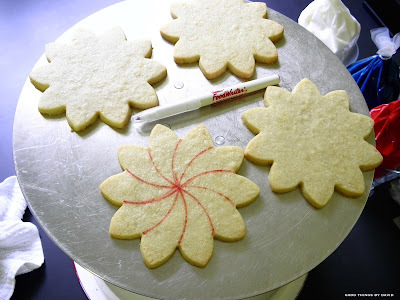 Using a round cookie cutter and a food-coloring marker, trace the curves to create vanes like I did above. Do this with each cookie. Since I wanted to do red, white and blue all the way I around, I outlined and flooded the appropriate areas with the colored royal icings. A single dragée was carefully placed in the middle. 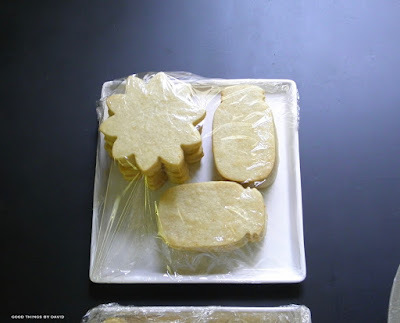 These were then left to dry completely before being finished off with white royal icing. There! Doesn't it look wonderful? 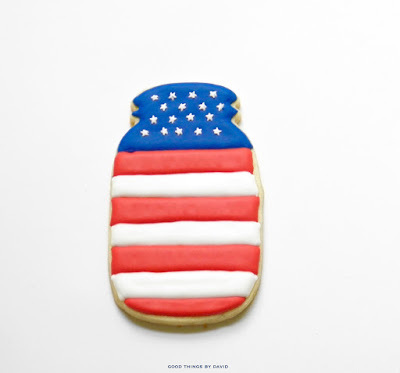 I think that this was perhaps my favorite cookie of the bunch. Don't tell anyone but I kept one of these for myself. 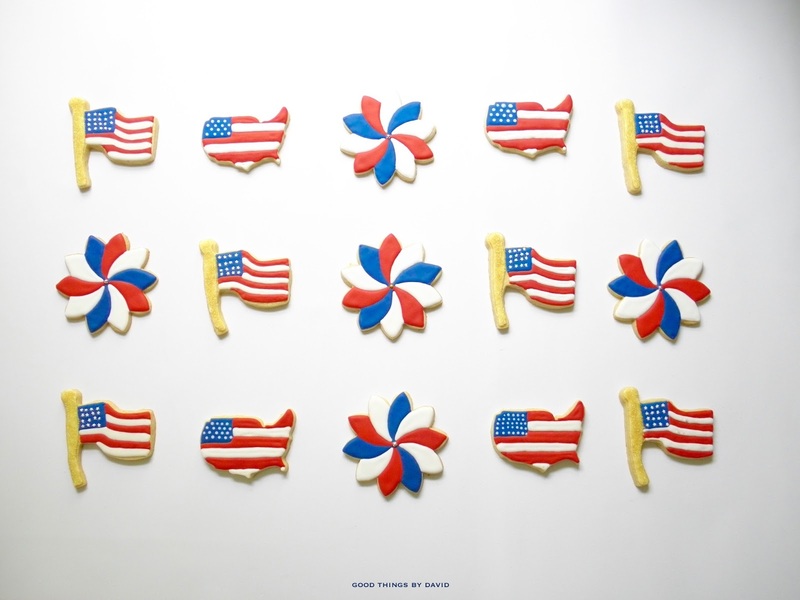 In this photo you can see the two styles of pinwheels next to one another. I think they look fantastic and are just right for gift-giving. 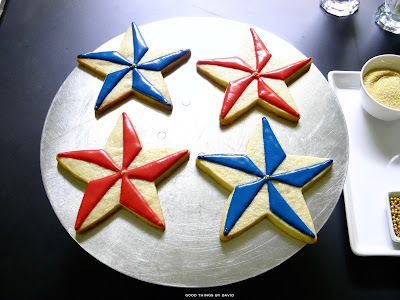 American Flag Cookies: Outline and flood the rectangular canton in navy blue royal icing, carefully placing white star candies on it while the icing is wet. You can also simply pipe white dots if you wish. Pipe red stripes down the flag and flood them as shown. You can either leave these to dry completely or you can then flood the remaining parts in white royal icing. 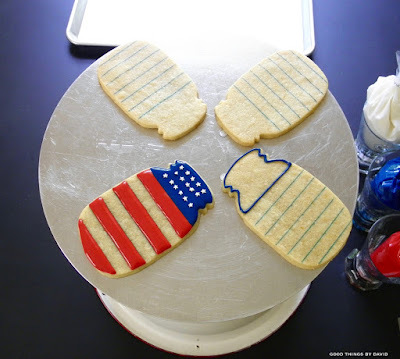 For the pole, outline and flood the area in white royal icing and immediately flock with gold sanding sugar. Let this dry completely before brushing off any stray crystals. This too is such a beautiful cookie. United States Cookies: Using a food coloring marker, trace a canton on the northwest area of the U.S and equally-spaced lines for the stripes of the flag. Outline and flood the canton in navy blue royal icing and pipe white dots for stars while the icing is wet. Outline and flood the red stripes of the flag with royal icing and let dry. I love how these look on my cake decorating turntable. When working with multiple styles of cookies, I try to fit as many cookies on a cookie sheet without having them touch as I wait for them to dry. 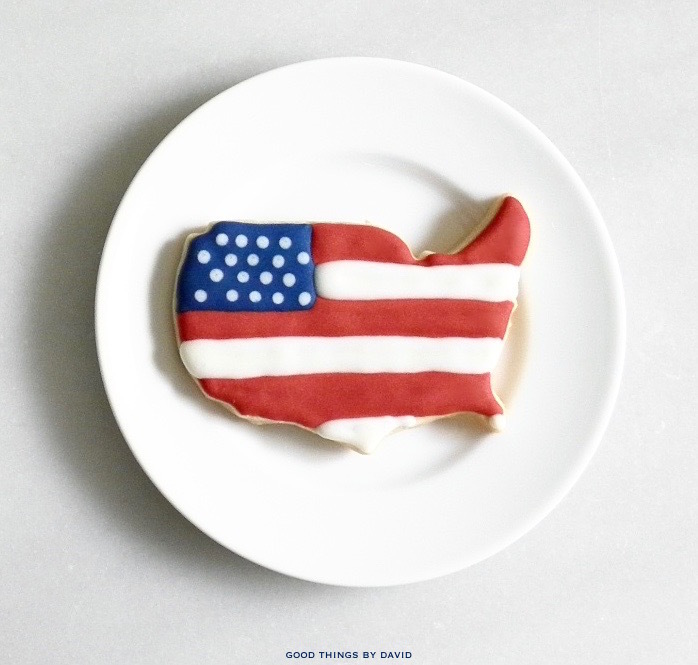 A beautifully iced cookie in the shape of this great country of ours. 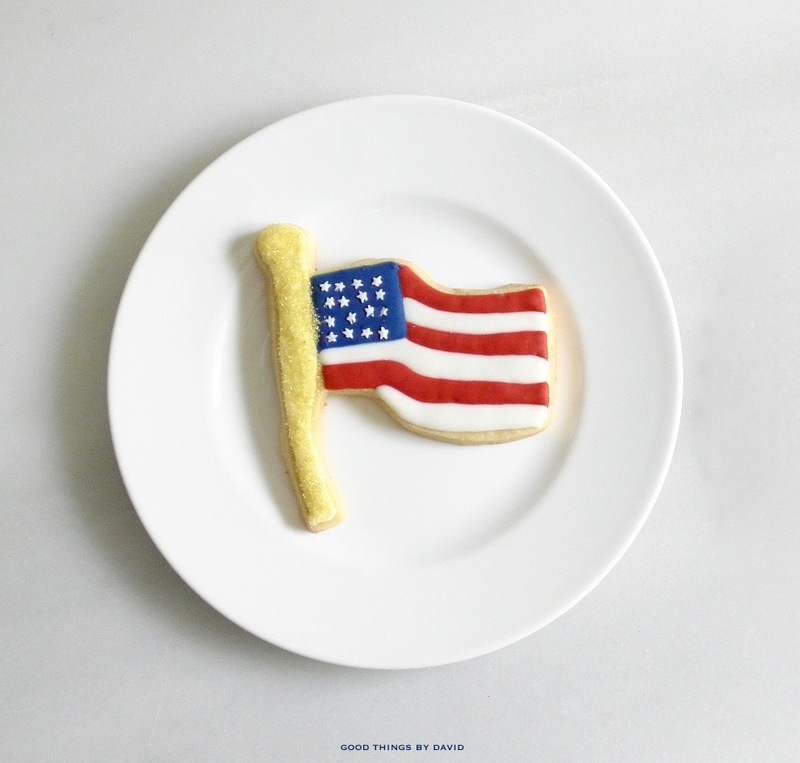 What could be more appropriate for the Fourth of July? American Flag Ball/Mason Jars: These cookies were also very simple to make. 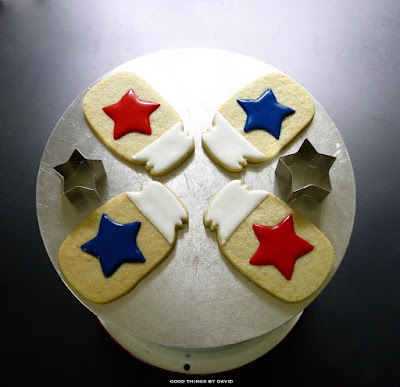 The top area of the jars were outlined and flooded with navy blue royal icing and were then covered with star candy shapes or dragées (keep reading). The red stripes (mark and trace these before you begin icing) were then outlined and flooded. 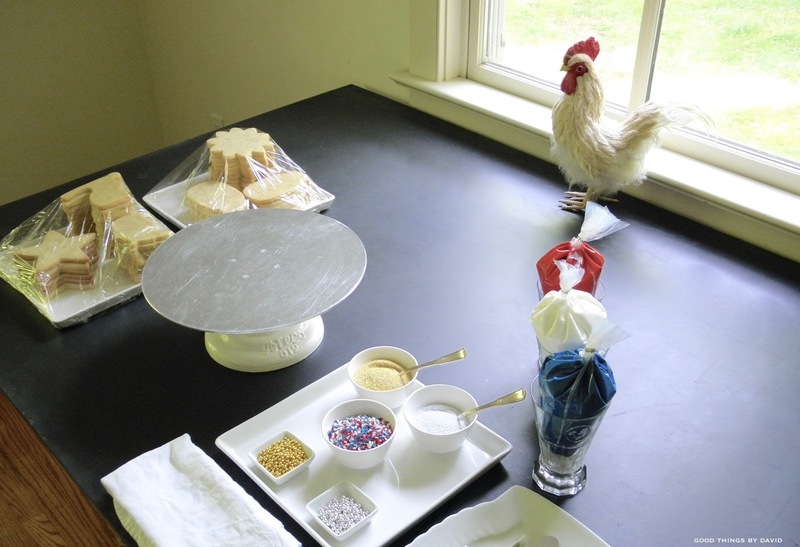 Everything was left to dry before continuing with white royal icing. This mason jar has the stars on the lid area. If you must know, the idea for these came from a crafting photo I saw on pinterest. 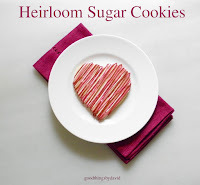 Leave it to a crafter to give me the idea for a cookie! Gold dragées add a different look to the cookies. I like both. 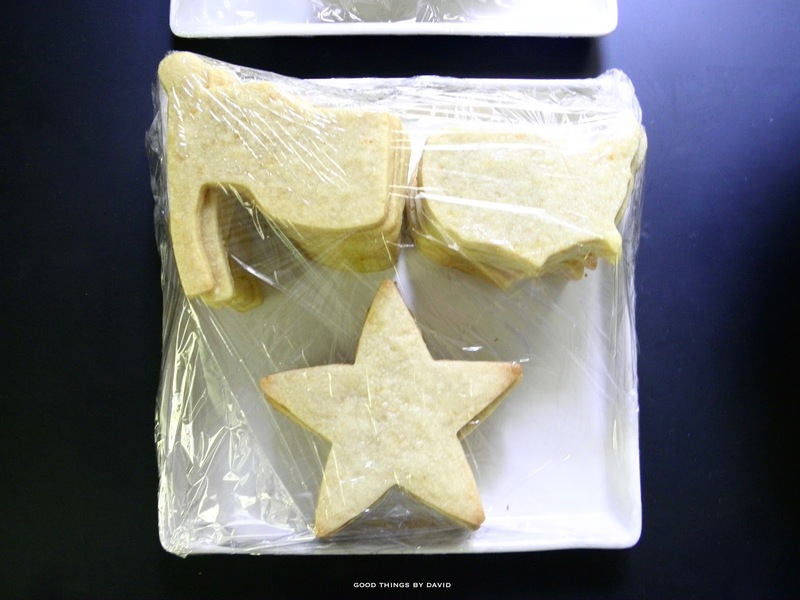 A long-time friend of mine who comes from the Lone Star State was in need of some Texas-inspired mason jars. For these, I left the lid area white and gave the centers of the jars a giant royal icing-filled star (traced with a food coloring marker). The rest of the cookie was then flooded in the alternating color. I'm always stressing the importance of rolling your cookies to a generous 1/4" thickness so that cookies can withstand all of the decorating and packaging. This side view of my cookie selection shows you how even all of them are. 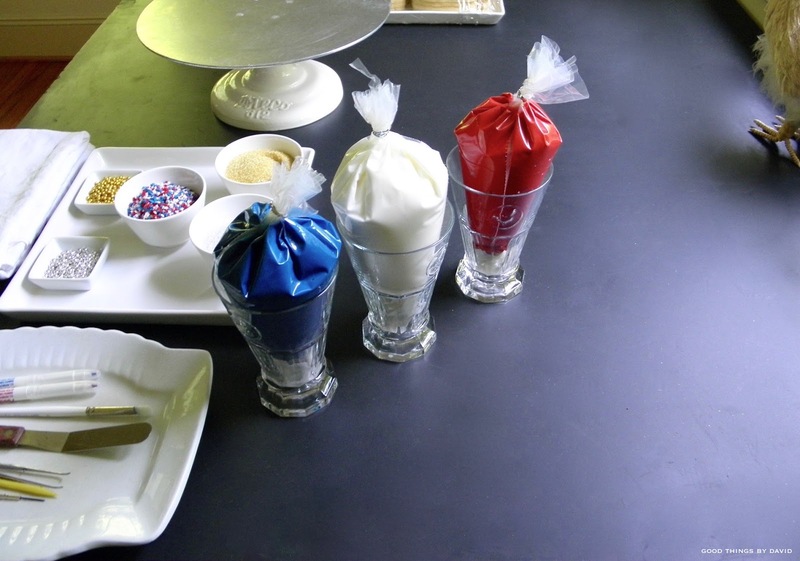 Clear cellophane bags and some ribbon will make packaging up the cookies a super easy task once the royal icings and sugars have set completely. For those near and dear, use boxes to stack a selection of cookies. 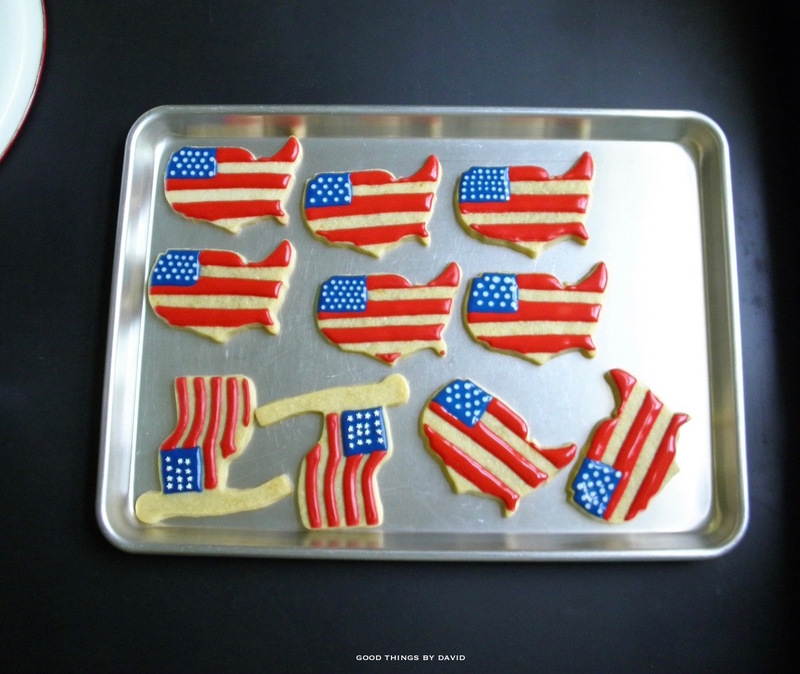 You can, of course, add American flag stickers to make them even better. If you're going to mail out cookies to loved ones, do follow my step-by-step tutorial on how to do this. The tips and lessons in that post are invaluable. Now is the time to start thinking about your Fourth of July celebration. Will you be hosting a barbecue at your house for friends and family, or will you be a guest at someone's home? 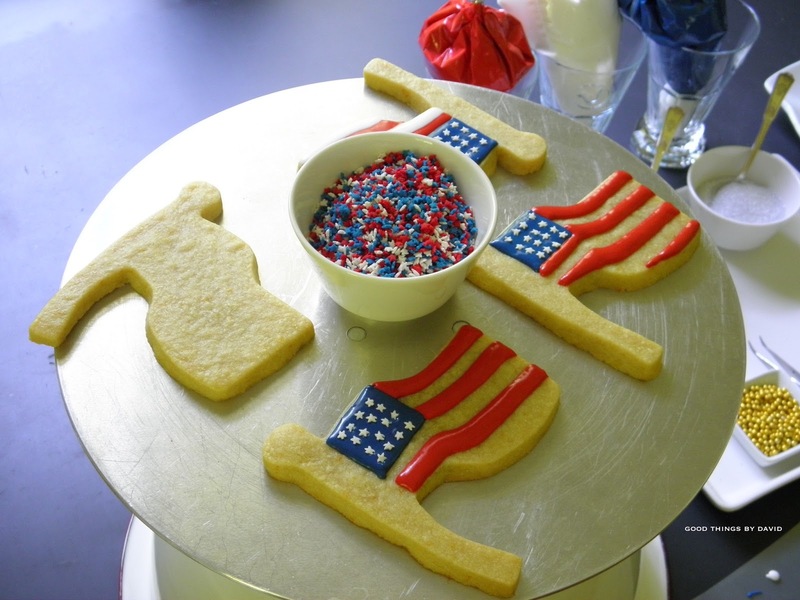 Either way, plan ahead and set aside some time to make a few of these American flag sugar cookies for guests. Pick one or two designs or pick them all and make a wonderful selection of red, white and blue cookies that are going to be the talk of the town. 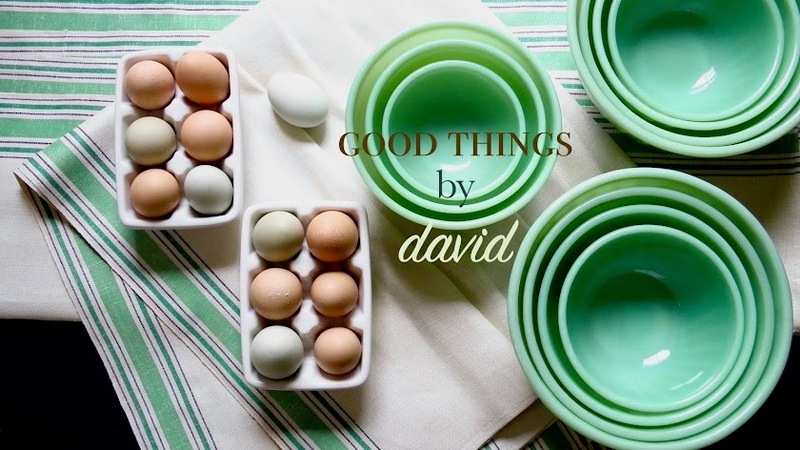 David all of these cookies are just wonderful! I'm ready to pull out the red, white, and blue for summer! These are beautiful! 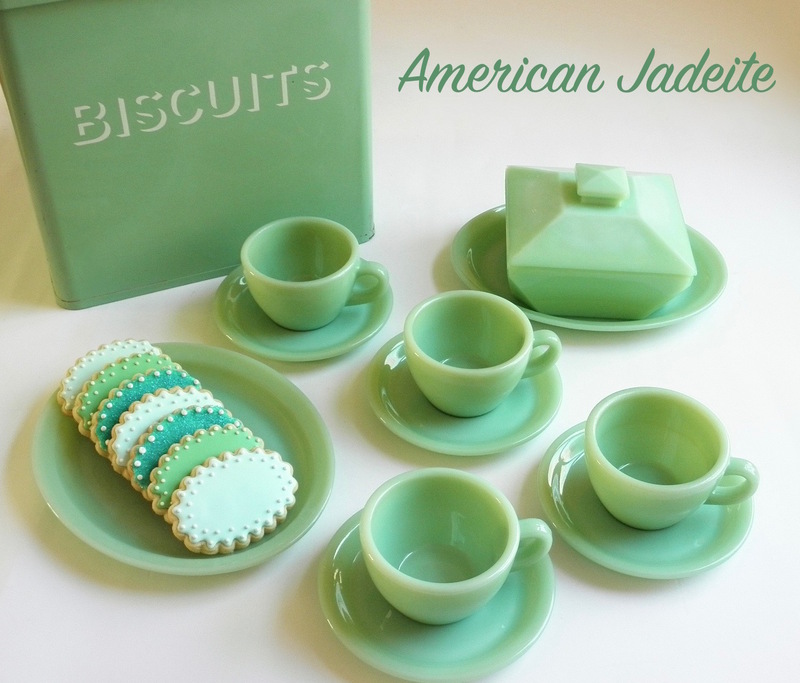 I wish I was handy with the royal icing but I don't have that talent. Thank you, Sarah! Oh, with a little practice you can easily make some pretty awesome sugar cookies. Try making a few when you have some spare time and decorate the cookies however you want. They'll be good no matter what! Oh, you darling man, you! You know I'm a sucker for the red, white and blue and boy, did you outdo yourself on these cookies! 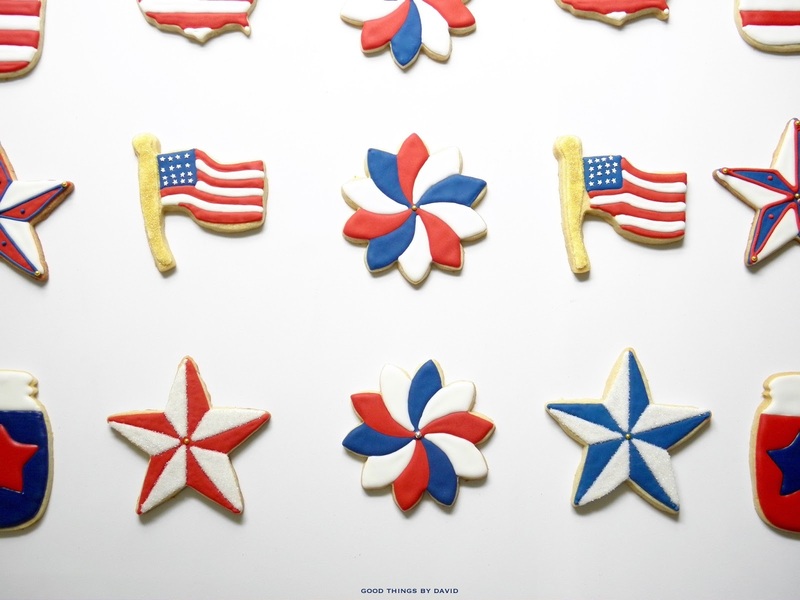 I LOVE the combination of sanding sugar and smooth royal icing - the Red/white pinwheels are perfection! Thanks so much for your kind words and friendship, Janet!!! Bisous! !